At Disney’s Hollywood Studios, the park is divided into two sections, on stage and off stage. This is why the guard gates are present on Commissary and near Backlot Express, and why the superstructures of so many set pieces are visible backstage. This unfinished element of the park, specifically surrounding Star Tours, is why we see set signs, canvas chairs, the metalwork holding up the AT-AT, and why the trees of the Ewok village are cut off before the reach their canopy. This backstage presence, however, could lend itself to a new queue experience when Star Tours 2 debuts in 2011. 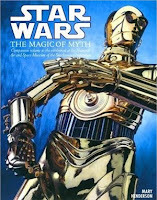 A long time ago, in a galaxy far far away I had the chance to visit the Star Wars: The Magic of Myth exhibit at the National Air and Space Museum of the Smithsonian Institute. This exhibit held countless pieces of Star Wars history, from concept drawings, to models, costumes, and props. For a fan of Star Wars in the 1990s, a time which offered very little in the way of new content, this was a dream come true. A exhibit such as this, though obviously smaller, would be a perfect accompaniment to an updated Star Tours attraction. Theme specific queue exhibits are nothing new in the world of Disney. The Living Seas had diving equipment alongside pieces from 20,000 Leagues Under the Sea. In Disney’s Hollywood Studios, The Great Movie Ride houses some remarkable pieces of film history, and exhibits like Journey Into Narnia, One Man’s Dream, and the Back Tram Tour are filled with treasures. With Star Tours, however, the unique opportunity of blending story and history has presented itself. Since we are boarding a Starspeeder provided by Star Tours at a spaceport the ability to showcase various flight uniforms of TIE pilots, Clone Troppers, Naboo pilots, and Death Star personnel would play perfect with a theme of the history of space travel. Additionally astromech droids from the films, as well as models of Jedi Starfighters, Star Destroyers, or the Millennium Falcon, could also be integrated rather easily. The ability to upgrade a queue, along with a beloved attraction, does not come along very often. With such a vast archive of material to choose from, the ability to create an exhibit that showcases not only film history, but the storied records of Tatooine, Naboo, Hoth, and Coruscant, the additions to the Star Tours queue could be a dream come true for fans of Star Wars.